This is a timeless piece which can accessorize so many outfits. 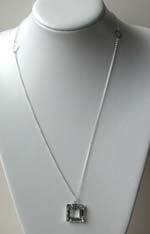 This necklace consists of a 32" sterling silver chain with diamond shaped connectors as detail half way down either side, echoing the gorgeous swarovski 2cmx2cm square shape pendant at the end of the chain(the necklace has been shortened for display purposes). The back of the swarovski square has been foiled making it catch the light all the more, making it perfect accompaniment to any evening outfit. If you like timeless monochrome, take a look at Edie-Jet.